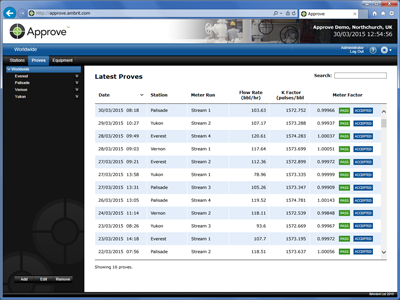 Prove results can either be manually entered into Approve™ or automatically collected from the flow computer (when used in conjunction with Acquire™ or Profile™) for accurate error free record keeping. Approve™ is a web-based tool designed to effortlessly manage all the prove data generated by flow computers. The prove results from every prove performed are stored in a centralised database, creating a comprehensive and accurate prove history. This prove data can be shared instantly and securely across an entire corporate intranet or over the Internet, enabling technicians, auditors, operations and management to monitor the performance of every meter on the system.